Born on 16 April 1893 in Great Village, Nova Scotia - son of Mrs. S.B. Yuill, [? ], Alberta - at the time of his enlistment in 1915: trade as law student, McGill College; single; currently a member of the active militia (no details); previously served with the 112th Cadet Battalion (Victoria, British Columbia); Church of England; height of 6 feet 2 inches; chest of 37 inches fully expanded; fair complexion; green eyes; dark brown hair. Attended McGill College, British Columbia, in the Faculty of Arts from 1913 to 1914. 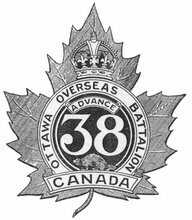 Joined the 38th Battalion, CEF, in Montreal, Quebec, on 24 February 1915 (number 410916) - departed for England in May 1915 - transferred to Princess Patricia's Canadian Light Infantry, CEF, on 17 July 1915 - commissioned as a lieutenant in March 1916 - transferred to the 52nd Battalion, CEF, on 4 June 1916 - wounded on 10 June 1916 - invalided to England in June 1916 - transferred to the 18th Reserve Battalion, CEF, in May 1917 - repatriated to Canada in November 1917.